We may have lost to Stanford, but have no fear, Pat Haden is here to cheer you up. His monthly State of Troy after the jump…. 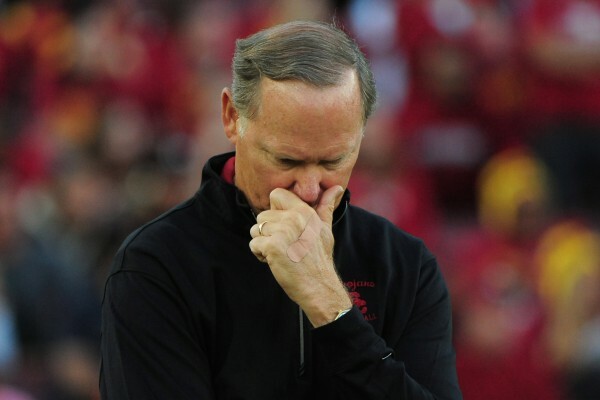 Sure, any loss is disappointing to our players, coaches and fans who all care deeply about USC. But this season is just getting started. We have nine regular season games to play, including a bunch of marquee match-ups. I still think we are as good as or better than everybody we are going to play. Let us just see how this thing plays out. We had an early season loss to Arizona State last year and ended up winning 10 games. Our goal is to win the Pac-12 South and get to the conference championship and then see what happens after that. That is still our goal. The NorCal Tournament is water polo at its best and Jovan Vavic’s team has done it again. Being able to do it year after year shows me how well they recruit and how well they coach and develop talent. Joel Dennerley was so valuable in goal for us the last few years, but James Clark has taken over and looks ready to carry the baton. Jovan has reloaded and the pipeline is full. Mick Haley is another coach who keeps bringing in fresh talent every year. Freshman outside hitter Samantha Bricio and sophomore setter Hayley Crone are taking over for All-Americans at their respective positions, but they are already playing at a really high level. We are the defending Pac-12 champions; UCLA won the national championship last year. It is No. 1 vs. No. 2 in a rivalry match. What else could you ask for? I will be at Galen Center with my wife and grandkids. Come join me to watch one of our premier sports. Click here for tickets to USC vs. UCLA women’s volleyball. Unless something breaks between now and Saturday, I am disappointed for our fans who cannot watch the USC/Cal game on DirecTV and several other outlets not carrying the network. Thankfully, there are plenty of other ways to watch the game with Time Warner Cable, Comcast and DISH Network having already picked up the network. I know the conference is doing everything it can to bring DirecTV on board as soon as possible. I am a DirecTV subscriber, and I have emailed them to let them know I want Pac-12 Networks. I encourage you to do the same. Basketball was disappointing last year. Until we prove we are better, I understand the skeptics. Having seen the additions made by Kevin O’Neill and Michael Cooper this offseason, I am very encouraged. On the men’s side, we finally have depth, especially inside with three seven-footers. The Wake Forest transfers J.T. Terrell and Ari Stewart can really score. And on the women’s side, Michael Cooper’s new assistant coaches are really good recruiters and teachers of the game plus they have a talented freshman class. Click here for Women’s Basketball season tickets. Unfortunately I am still pissed about Stanford.